How to get there: One can take the (local) train to the small station called Ørnaberget, or one can drive from Bergen via Voss to Mjølfjell. The distance from Voss is about 36 kilometer. The public road ends at the youth hostel. For more details, see the excellent description by Arnt Flatmo. 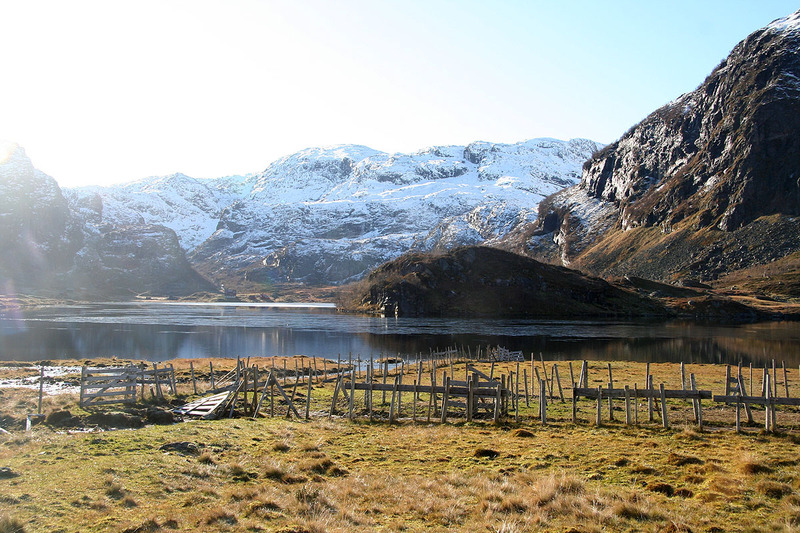 Route description: From the youth hostel, continue up the gravel road then fork right where there is a sign saying Slondal. You cross the main river and arrive at the end of the lake. There are trails on either side. The shortest route would be to follow the west side of the lake, then climb right near the creek that comes down from Mjøfjellet about halfway along the lake. This route is described by Arnt Flatmo. A longer, but pretty nice route proceeds along the lake (pick your side at leisure) to its south end. From here, a very distinct valley climbs south-west. There are two valleys, you should take the right fork following the trail that crosses to Tryglabotnen. Ascend all the way towards the saddle at elevation 1220 meter. There are some huge rocks up here and you should turn sharply right and ascend a bit more steeply up a ramp just before reaching the saddle. Ascending from the south, you will see cairns and some painted markers leading uphill. 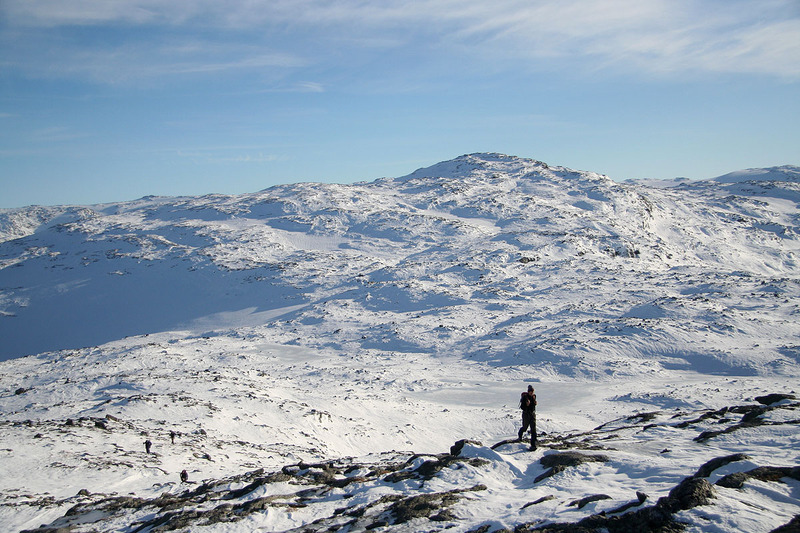 Higher, you again bear right as you climb through a distinct notch before reaching the more level plateau area. 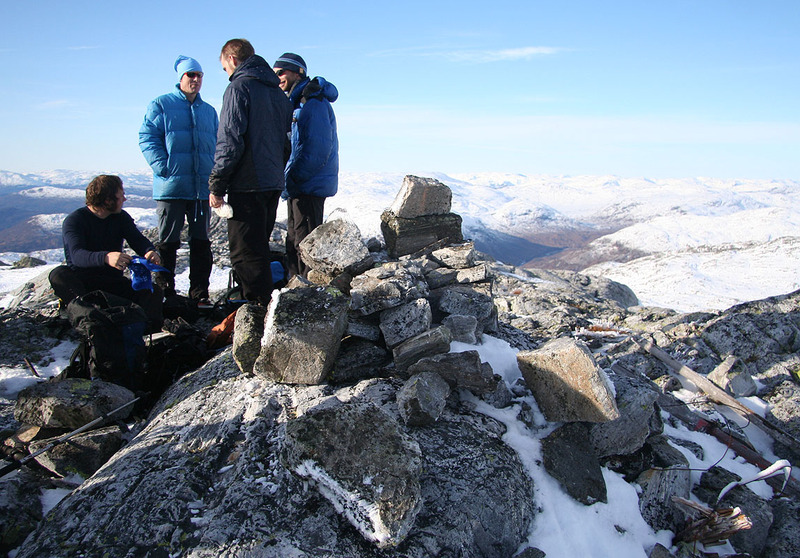 The summit is now about 900 meter south-south-east beyond a small false sumit marked as point 1427 on the map. 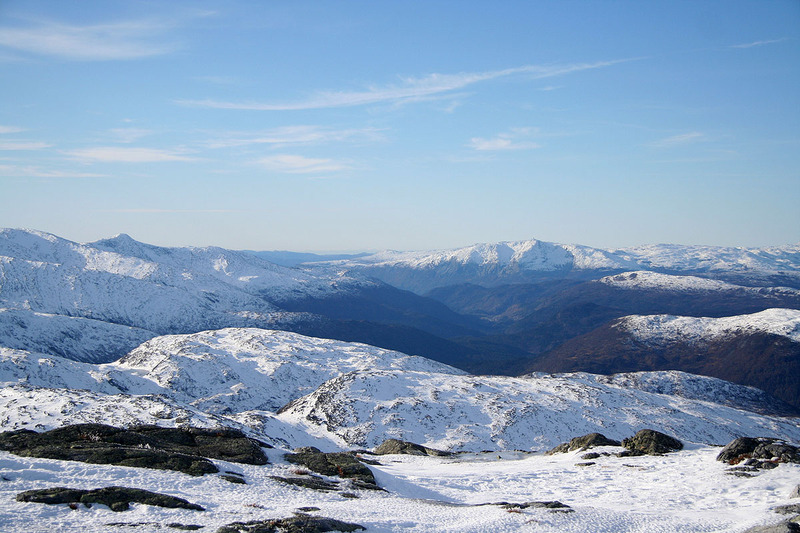 In order to make a nice roundtrip, one can either descend back down further north to lake Slondalsvatnet or one can hike north to the 1374 meter subsidiary summit that marks the county border between Voss and Ulvik. 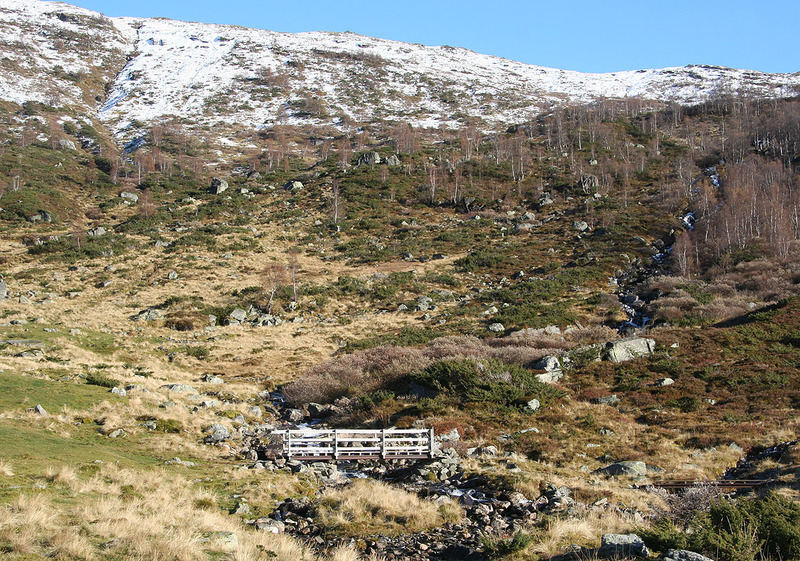 From this cairn it is easy to descend further north along the creek Skredteigselvi, best on its west (left) side. 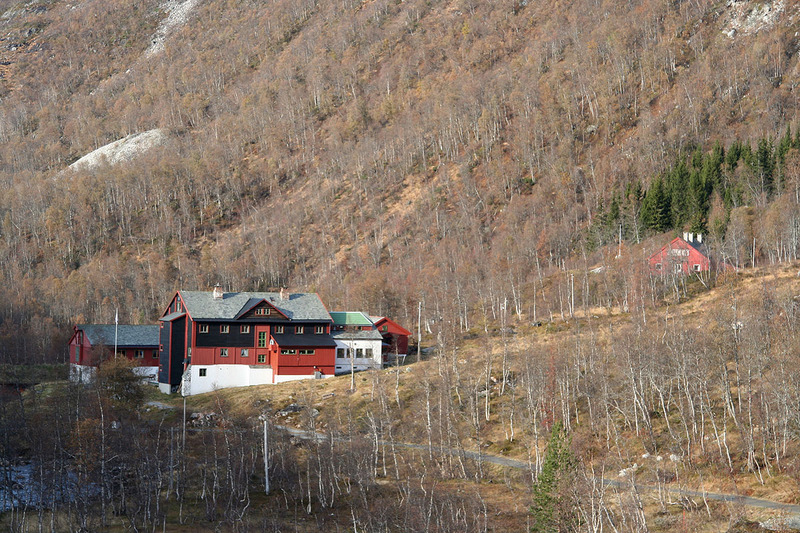 Cross the bridge to Høghaug or hike east along Kleivelvi to the bridge by the youth hostel. Comments: This weekend was allocated to celebrate the 40th. 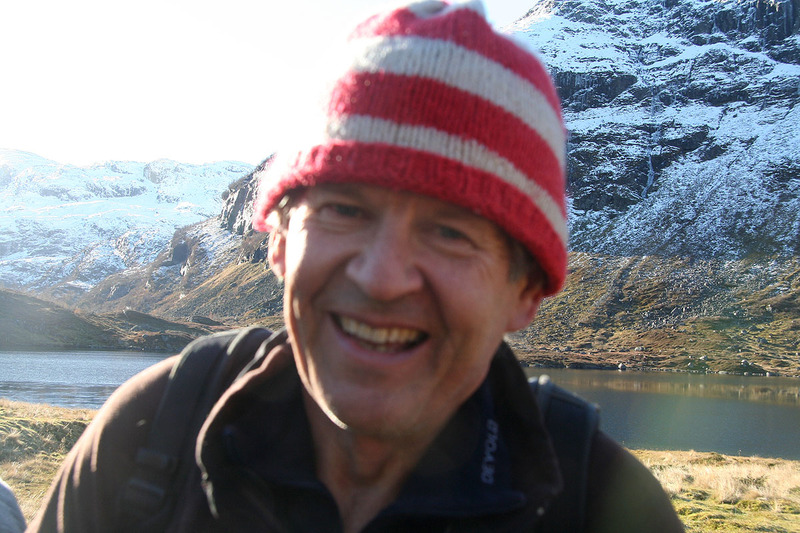 anniversary of the Bergen Mountaineering Club, in Norwegian, DNT Fjellsport - Bergen. About 50 people participated, the venue being the hut owned by Bergen Katedralskole (a more than 800 year old high school in Bergen). Arriving on Friday, most people wanted a hike on Saturday before the big party. The weather was just gorgeous, the mountains showing off what fall is really like. The valley dressed in yellow and brown, with the white snow higher up on the mountains. A bit limited for skiing, but inviting everyone out for a nice walk. We all headed into Slondalen to the farm cabins on its eastern side. Here, we divided into two groups. The easier, shorter option being an ascent of Magnhildenuten, 1167m, while the longer hike would be an ascent and traverse of Mjølfjellet. 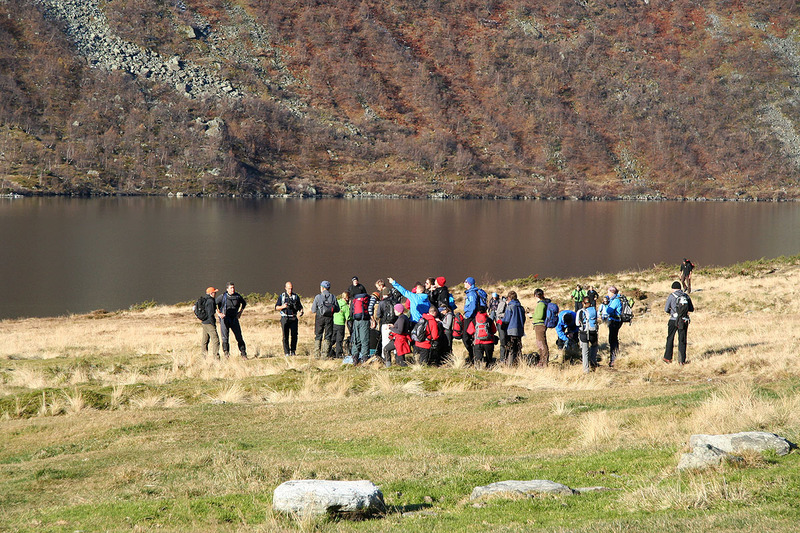 Olav organized the group that headed up Magnhildenuten, while 18 of us continued south in order to climb Mjølfjellet from its south end. 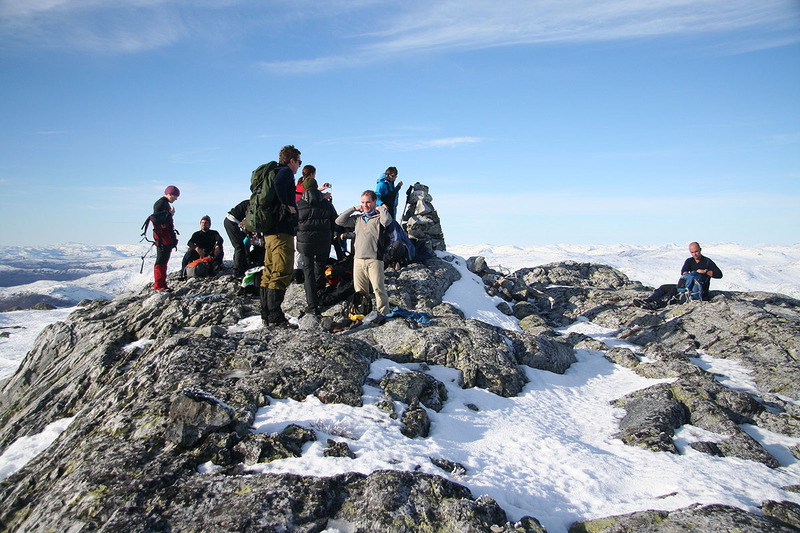 We had started out around 1115 and keeping a leisurely pace, we reached the highest summit on Mjølfjellet by 1430. A good rest was called for. Fantastic view, sunshine and no wind. I put my GPS on the cairn and went on to take a few pictures. Suddenly, the cairn collapsed without much warning. Clearly, somebody had inadvertently pushed it over. I searched through the rubble and retrieved my GPS, seemingly unharmed. Thus, the next task in order would be to construct a new cairn, hopefully a bit more solid than the one we had destroyed. We continued our trip around 1500, the snow was quite good for walking. Our next stop, the north summit that is about 100 meter lower, had a substantially bigger (and more sturdy!) cairn. From here, we continued north, descending near the creek Skredteigselvi. One group (6) went straight down the ridge and crossed the main river, then taking the road back to Katteli, while 10 of us took a slightly more adventurous route, crossing the creek fairly high while descending on a north-east traverse. We were all back at Katteli well before 1700 ready for a three course dinner, live music and a good celebration of the first 40 years. Many thanks to the organizers for an extraordinary effort making this weekend a very nice and successful event. 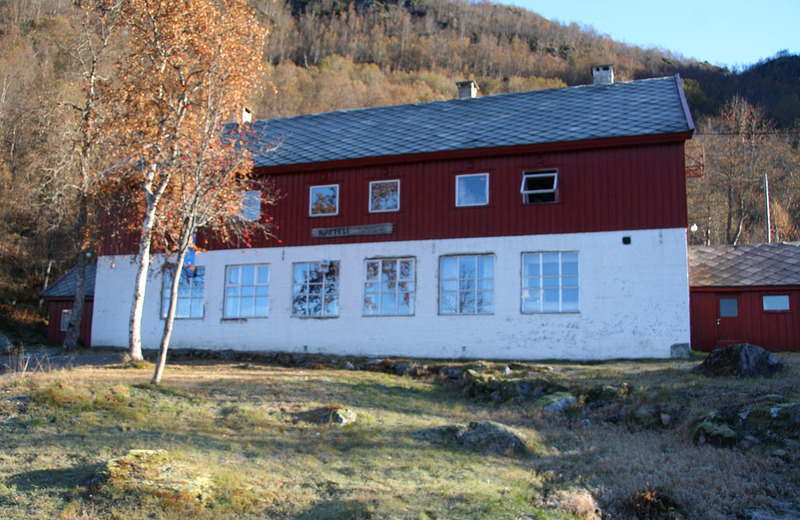 The Katteli hut, belongs to a high school in Bergen. 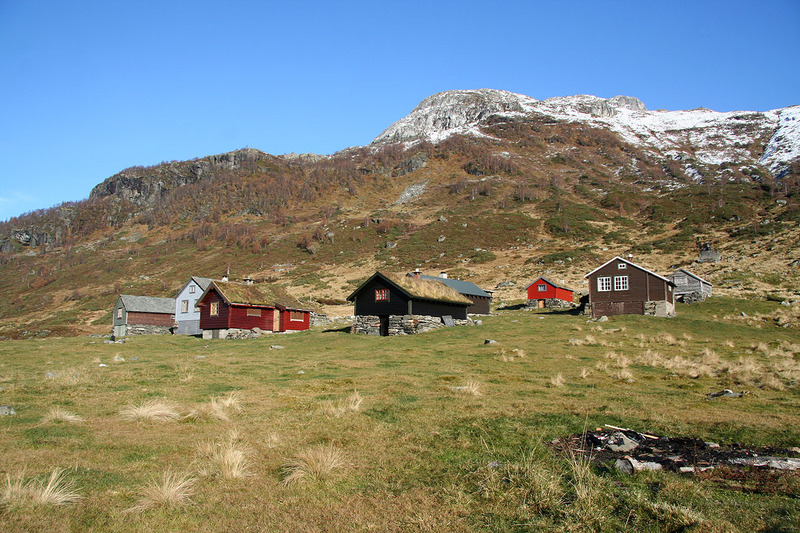 The Slondal seter, traditional mountain farm buildings. Bergen Fjellsport, a pretty large group. Me, as the group splits. Slondalsvatnet, 752m, we continued south, then more west up a distinct valley. 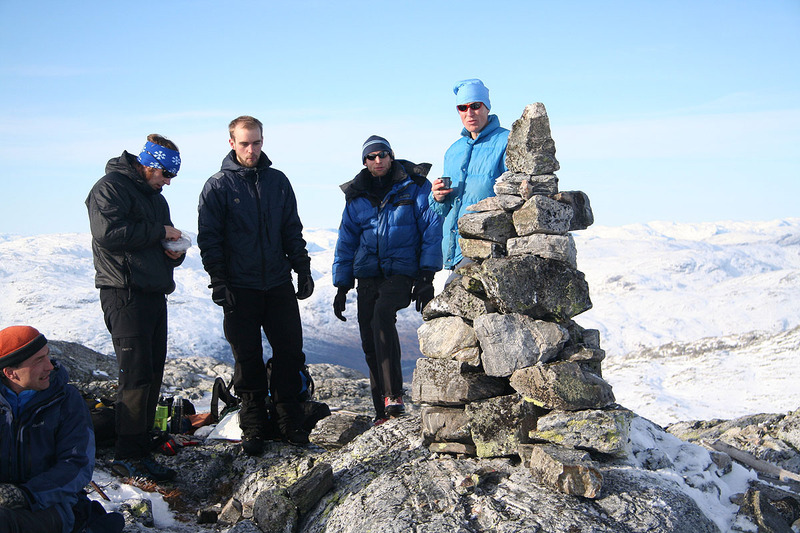 The summit, note the summit cairn. Summit destruction, a cairn in ruins. View west, Lønahorgi near Voss. The main summit, as seen from the north summit. 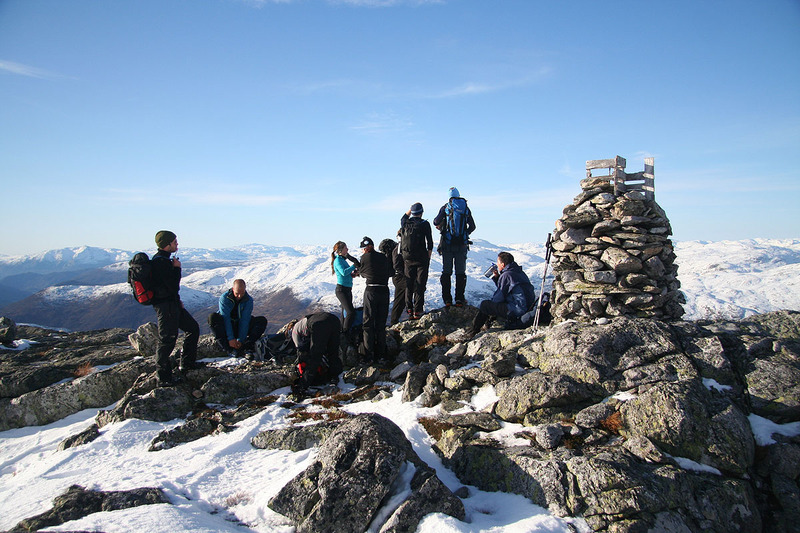 The north summit, a bigger cairn, a county border between Ulvik and Voss. The youth hostel, Katteli behind on the right.